Do you have a light in your Tampa home that seems to only work when it wants to? Call us for affordable lighting repair! You turned on a light switch and the light didn’t illuminate. After checking the bulb and the circuit breakers, you are at a loss. Don’t feel bad; it can be perplexing to figure out if the problem is the lighting fixture or perhaps the wiring. That unsettling feeling that you may have a wiring short is something nobody wants to face. 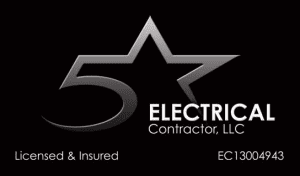 Rather than spend a restless night worrying that you may be awakened by an electrical fire, call us at 5 Star Electrical LLC. Our lighting repair team will be able to quickly diagnose the problem and take care of it for you. We have the expertise to handle the lighting repair even if it is a large re-wiring situation. We can also check out the health of your Tampa, Florida home’s electrical system, so you can have peace of mind that it is all safe. Our lighting repair services can also help you should you want more lighting or want to move any existing lighting to an ideal location. If you have any dark areas or have lighting that just doesn’t give you the level of illumination you need, let us help you with that. We can also replace old, antiquated lights with more attractive, modern ones which can easily transform any room. We provide lighting repair and other electrical services for both residential and commercial properties in Tampa. No job is too small or too large. We can also upgrade your home with sound system wiring, security system wiring, and/or smart home system installation. Whatever your lighting repair or replacement needs are, call us.